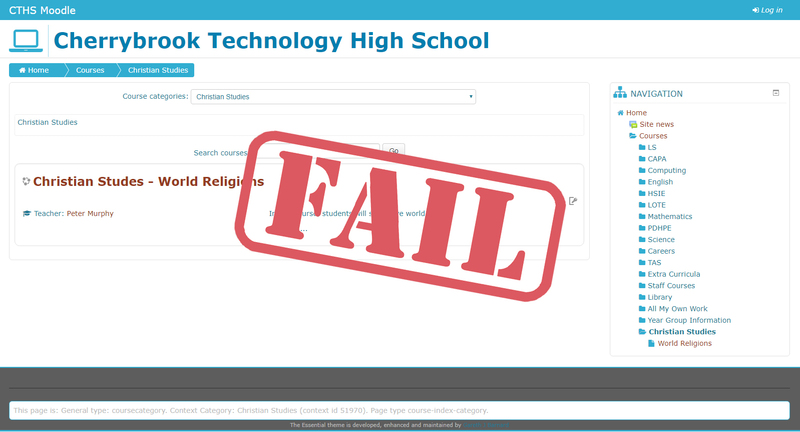 In the second of FIRIS’ Special Religious Education (SRE) School Report Cards, Cherrybrook Technology High School (CTHS) gets an ‘F’ for failing to demonstrate to the citizens of NSW a respect for the rights of students and their parents / caregivers as well as a respect for the secular nature of NSW public schools. 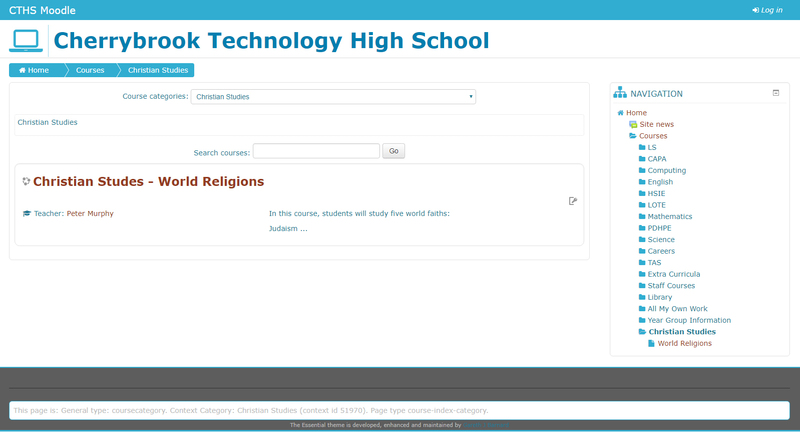 All students attend Christian Studies lessons unless their parents requests that their child not do so. As in the case of Chatswood High School, CTHS’ statement is at odds with ChristianSRE’s smoke-screen claim that SRE is ‘opt-in’ and that no child is in scripture without permission from parents. The members of the scripture lobby making this disingenuous claim know full well that the current Religious Education Implementation Procedures (the Procedures) and all of its supporting documents, including the flowchart mentioned in the image above, currently enable principals to make the SRE enrolment process work on an ‘opt-out’ basis. CTHS is able to state the above without breaching the Procedures and this is exactly what the scripture lobby have wished for. The history of the amendments to the Procedures make it very clear that the claim that ‘parental choice is necessary for any child to attend SRE’ is grossly misleading given that the current enrolment process dismisses a declaration of ‘no religion’ and then subjects those parents and caregivers to an intentionally flawed process aimed at maximising the chance that a child ends up in scripture without informed and express consent. Therefore, to try and protect the rights of all students, in July this year FIRIS sent to the principal of every public school principal in NSW, including the principal of CTHS, an important statement from the Minister (intentionally omitted from the Procedures), that directs schools to provide the children of parents who have not made their express wishes known with alternative activities to scripture. FIRIS amended the Department’s enrolment flowchart so it was aligned with the Minister’s statement, something that the both the Minister and the Department have refused to do. FIRIS will be watching whether the principal of Cherrybrook Technology High School does better next year. religious organisations will deliver it. This information is provided through enrolment information, the school website and school newsletter. FIRIS has not found any information available to the public regarding scripture on the CTHS website or in any of the 32 newsletters released by the school in 2018. Taking pages from the ‘how-to-embed-scripture-in-NSW-public-schools-and-blur-the-boundaries-between-evangelists-and-professional-teachers’ guidelines written by the scripture pressure-group, the Inter-Church Commission on Religious Education in Schools Inc. (ICCOREIS), CTHS, like Chatswood High School, has no problems blurring the boundaries between the scripture instructor at CTHS and professional educators. Rather than ensuring that parents and caregivers are provided with clear information using names and terms used in the Religious Education Policy and the Procedures, it seems that the principal of CTHS has no problem with the SRE instructor, Mr Peter Murphy, referring to SRE as ‘Christian Studies’, and to himself as the ‘Christian Studies Teacher’. Given that Mr Murhpy has been provided with a Department of Education email address and given the lack of information available to the public on the internet regarding SRE and Mr Murphy, FIRIS has concerns regarding the extent to which Mr Murphy may be fulfilling ICCOREIS’ aim that he become a ‘fixture’ at the school. A parent or caregiver of a child attending CTHS might be excused for confusing Mr Murphy for a professional teacher employed by the Department to teach a subject developed by the state government education board, NSW Education Standards Authority (NESA). But that he is not! 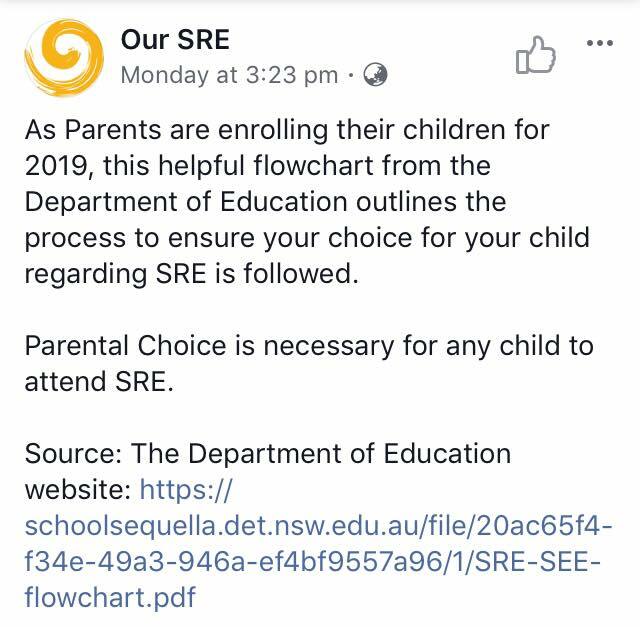 As stated above, parents have the right to information regarding SRE and this information should be provided in enrolment information, in school newsletters and on the school’s website. education and alternative activities offered at the school. communicated to the school community. FIRIS has not found any information regarding SRE available to the wider community on the CTHS website or in any of the 32 newsletter released so far in 2018. Members of the wider community cannot determine who the approved SRE providers are responsible for SRE at CTHS. 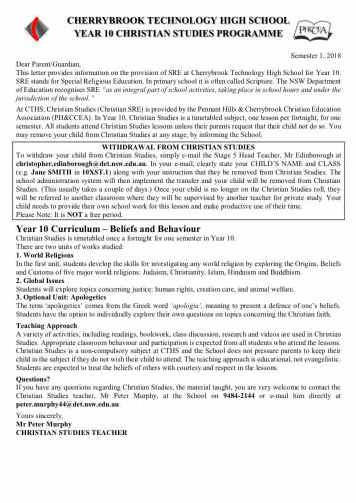 The note sent home to parents and caregivers identifies Pennant Hills & Cherrybrook Christian Education Association (PHCCEA) as the providers of ‘Christian Studies’ at CTHS. However, PHCCEA is not an approved provider of SRE. Furthermore, based on statements made by the Department and Generate Ministries, parents and caregivers of students at CTHS, and the wider community, cannot assume PHCCEA is the ‘combined arrangement’ (as mentioned in the Procedures) responsible for the supply of Mr Murphy to CTHS. . Some of the background to the issues related to ‘combined arrangements’ are pointed out in the SRE Report Card for Chatswood High School. FIRIS has found no information regarding the combined arrangement/s responsible for the delivery of SRE at CTHS on the school’s website or in any of its 2018 newsletters. authorising the SRE curriculum used at CTHS. The note also does not provide information about how parents and caregivers can locate and access the approved curriculum’s outline and its scope and sequence documents. It seems that if parents and caregivers want information they must ring or email Mr Murphy. However, over the last two years, FIRIS has found it very difficult to obtain information regarding combined arrangements from various schools throughout NSW, the Department of Education and others, such as Generate Ministries. This complaint is currently under investigation. FIRIS has not received any response from the principal and on 12 November 2018 FIRIS lodged a complaint with the Director, Educational Leadership responsible for CTHS. At this point in time, FIRIS has not received a response from the Director. In consideration of the above correspondence, and all other previous correspondence with the Department and other stakeholders, FIRIS suspects that no one knows what the hell is going on or if they do, they have no interest in fulfilling an important obligation of stakeholders in self-regulating systems, that is, transparency to the public. It seems that the Procedures’ nebulous concept of ‘combined arrangements’ enables a ‘confusopoly’ readily exploited by Christian churches and organisations and a system in which responsibility and accountability can easily be avoided. Although FIRIS is aware that PHCCEA is not an approved provider of SRE and that it is most likely not to be regarded as the combined arrangement, it needs to be noted that the website of PHCCEA does not identify itself clearly as the ‘combined arrangement’ and the association does not identify the approved providers making up the combined arrangement responsible for the delivery of SRE at CTHS. Furthermore, it does not even identify the local churches making up PHCCEA. Information regarding PHCCEA on Generate Ministries’ ourSRE website identifies 13 ‘supporting churches’ from up to seven Christian denominations, but as Generate Ministries have been quick to point out, this information cannot be used to try and determine whether CTHS or approved providers are adhering to the Department’s Procedures. As stated in the Chatswood High School Report Card, if no one knows what is going on, the Department is at risk of not fulfilling its duty of care to all NSW public school students. is/are are accountable to the Department. – the PHCCEA website does identify and provide a link to the SRE curriculum. For once, parents, caregivers and the wider community are given some important information. The curriculum document identifies that the curriculum was authorised in 2013 by the Baptist Union of NSW, an approved provider of SRE in NSW, under the delegated authority of the Pastor of Pennant Hills Baptist Church. So, it seems that parents and caregivers can assume that the combined arrangement is made up of, at least, the Baptist Union of NSW. Now, apart from the duty of care of principals to ensure only authorised personnel are accessing NSW public school students, and in consideration of the risks associated with the messages promoted in SRE, principals also have a duty of care to ensure that only the children of parents and caregivers belonging to the ‘religious persuasion’ of the members of the combined arrangement are enrolled in SRE. In a combined arrangement only those students whose parents/caregivers have nominated them to attend SRE classes of one of the participating religious persuasions are to be included. In 2018, there were 1986 students enrolled at CTHS. Given the absence of any other available information FIRIS will once again assume that the denominations identified on the ourSRE website are possibly approved providers forming part of the combined arrangement, in addition to the Baptist Union of NSW. Enrolment data does indicates that 151 students were enrolled as ‘Christian (Other)’ but, according to the Procedures, these students should not be enrolled without knowledge of which specific Christian denomination the students belong to. Based on the enrolment figures above, FIRIS estimates that the maximum number of students who should be enrolled in SRE at CTHS is 841 (approx. 42% of school population). According to the the PHCCEA website, Mr Murphy and the SRE instructor at Pennant Hills High School have ‘fortnightly contact with about 3000 students’, however FIRIS hopes that this is reference to casual contact with the total student population and not to actual SRE participation figures. FIRIS is aware that some high schools have claimed SRE attendance figures of between 90-100%. For many students, coming from families of other faiths or no religious belief, Christian Studies classes provide them with their first real opportunity to explore and examine the claims of Christianity. FIRIS finds very suspect the claims by the scripture lobby that the parents of these children are making a choice to have their children attend Christian SRE. Unfortunately, the Department refuses to collect actual participation figures despite two independent reviews recommending that they do so. 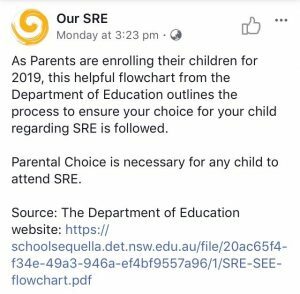 Therefore, it is not possible to make any definitive statement about how many of the above cohort of students have ended up in SRE. As in the case of Chatswood High School, the seeming failure of CTHS to act with honesty and integrity may easily be regarded by a reasonable member of the NSW public as an intentional failure to preserve the secular nature of NSW Government schools. When it comes to preventing NSW public schools serving as ‘mission fields’ for Christian churches, CTHS also gets an ‘F’. 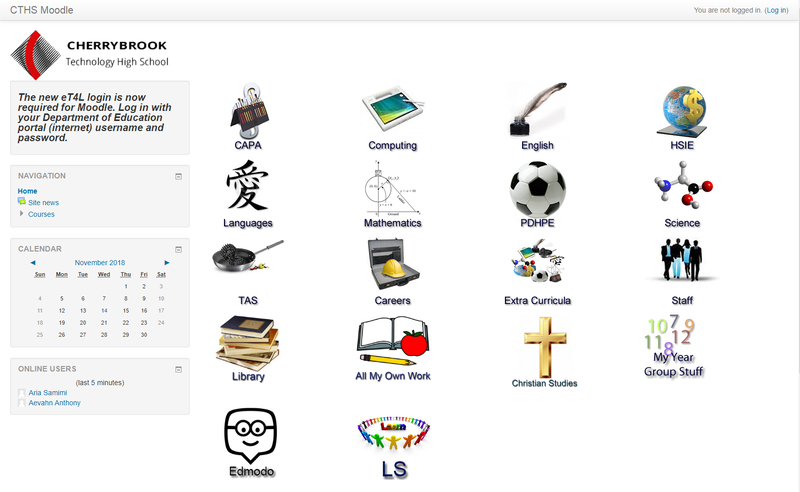 PHCCEA is identified as a ‘link missionary’ on the website of St Matthews Anglican Church (West Pennant Hills). PHCCEA is also identified as a ‘mission’ of Cherrybrook Anglican Church. students need to know Christ! Our motivation comes from the fact that we know that “faith comes from hearing the message, and the message is heard through the word of Christ.” (Romans 10:17). We know, from our own experience, the transforming power of the Gospel, and this compels us to make the most of the opportunity we have been provided to share the message of salvation through Jesus Christ with the more than 3,000 students who attend Christian Studies classes at Pennant Hills High School and Cherrybrook Technology High School each fortnight. …do you believe that we, the church, have been entrusted to make known the good news of Jesus? Do you believe that by ourselves we are separated from God, dead in our transgression and sin, without hope and without God in the world? Do you believe that God, at his initiative, because of his great love for us, has acted to bridge the gap created by our sin and rebellion that keeps us from him? Do you believe that when Jesus said ‘I am the way and the truth and the life. No one comes to the Father except through me?’, that he meant it? Do you believe that the gospel of Jesus Christ is very good news; as the old hymn says ‘strength for today and bright hope for tomorrow’? Do you believe that knowing Jesus is transformative and glorious? I do. I really do. We must never let it fail. It is such an outstanding opportunity for mission in our local area, within our community. 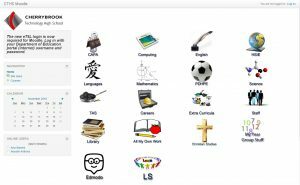 For ensuring that ‘it’s too easy’ for evangelists to turn NSW secular public schools into ‘mission fields’ for Christian churches, CTHS gets a resounding ‘F’.